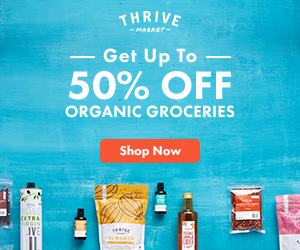 What do you get when you cross the attributes of the Mediterranean diet, with the principles of the Paleo diet and the 1930’s research of Dr. Weston A. Price? 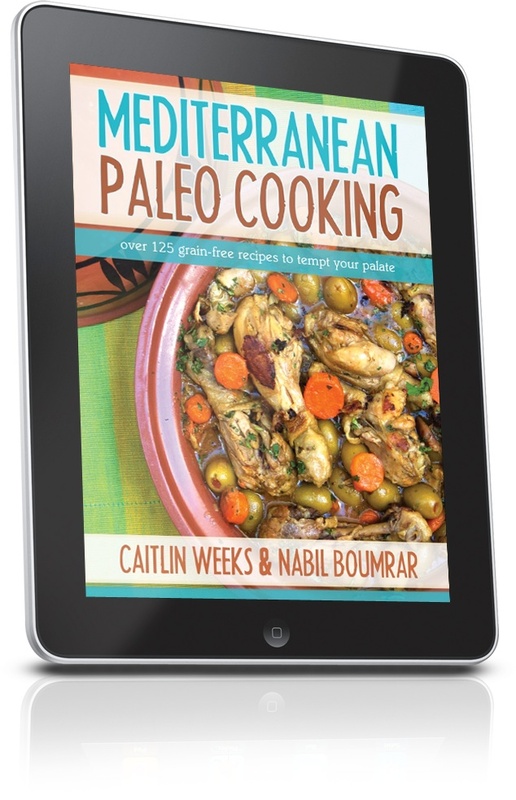 Mediterranean Paleo Cooking by Caitlin Weeks and Nabil Boumrar. Caitlin is a certified Nutrition Consultant and author of the blog Grass Fed Girl and Nabil is a professionally trained chef born in Algeria. They are the perfect duo to create a Mediterranean cookbook emphasizing a whole foods lifestyle. You’ll find both nutritionist tips and chef’s tips spread throughout the book. This new e-book includes over 125 recipes like Herb de Provence Biscuits, Lamb Kebab, Fig and Ginger Chicken Tajine, and Tahini Truffles. The classics are included like Cauliflower Hummus, Tabouli Salad, Falafel, and even a Mediterranean Paleo Pizza. If you have any allergies or food sensitivities, want to explore ethnic recipes and exotic spices, or just want to add more variety to your repertoire you need to get this book. Paleo diets usually exclude grains, legumes, and limits dairy to reduce their inflammatory effects on the body. But even if you are not following a paleo diet there is plenty in here to explore – it’s all about eating whole foods so you won’t find any processed food ingredients in the cookbook. In addition to the recipes there are also tips on stocking a Mediterranean Paleo Kitchen, How to Choose Healthy Fats, a shopping list and resource guide. The recipe sections include, breakfast, salads, soups, appetizers, poultry, red meat, seafood, offal, vegetable sides, desserts, and sauces, broths and butters. There are a few recipes that include shellfish and pork – but with 125 recipes there is still plenty of kosher style recipes to explore. And with limited dairy in paleo cookbooks there isn’t that much substitutions needed to prevent mixing dairy and meat. I’m still finding plenty of recipes I need to try with no issues adapting it to my kosher kitchen. One of the first recipes I tried was this dairy-free Chocolate Pot de Creme which I adapted below. I loved their tip to make it in a double boiler resulting in the perfect texture. And the best part: no one tasted the coconut – a definite plus in my picky household. Adapted from Easy Pot De Creme from “Mediterranean Paleo Cooking”. Many pot de creme are made in the oven, but this easy version uses a double boiler. To make your own double boiler: place a glass bowl over a saucepan filled with a few inches of water. The water should not be touching the bowl. 1. Heat 2 inches of water in the bottom of a double boiler over medium heat. 2. Melt the chocolate in the top of the double boiler. 3. Add the coconut milk and the eggs to the melted chocolate, stirring continuously with a whisk. 4. Add the vanilla, sweetener and rosewater. 5. Stir continuously until it is thick, about 15-20 minutes. 6. Put chocolate mixture into custard cups and refrigerate until set, about two hours. Sounds delish! Do you think anything would be affected if I left the rose water out? Do you mean like calorie counts, etc…? I don’t provide that – there are other sites online like NutritionData that you can input a recipe and get nutrition info. I don’t think it’s necessary to count calories and fat grams when eating a diet of whole unprocessed real foods. As a chocolate lover,I’m definitely interested in making such an exquisite treat! I just hope I get this right! Thanks for sharing your recipe. Hello, will the eggs cook while mixing them with the warm chocolate? Based on my experience with custards, the principle the same as with other similar recipes. It would be best to mix the whisked eggs into the coconut milk and then slowly pour the mixture into the chocolate while whisking the chocolate continuously. If it failed and you got lumps, you could put it through a strainer to rescue it. I noticed it doesn’t say when to use the cinnamon and nutmeg, but I would add it at the same time as the vanilla. I may very well try this recipe myself! Great timing too as I was just looking for something for my mom’s birthday next week.